If you have never had a chance to see Halong Bay - the UNESCO World Heritage Site in the East Sea, it would be so regret. This land is not only having the spectacular scenes hidden in limestone caves, rocky peaks directing sun. But also the perfect blend of the colors of vegetation, water and clouds. All are the art of nature without a pen that can draw well. 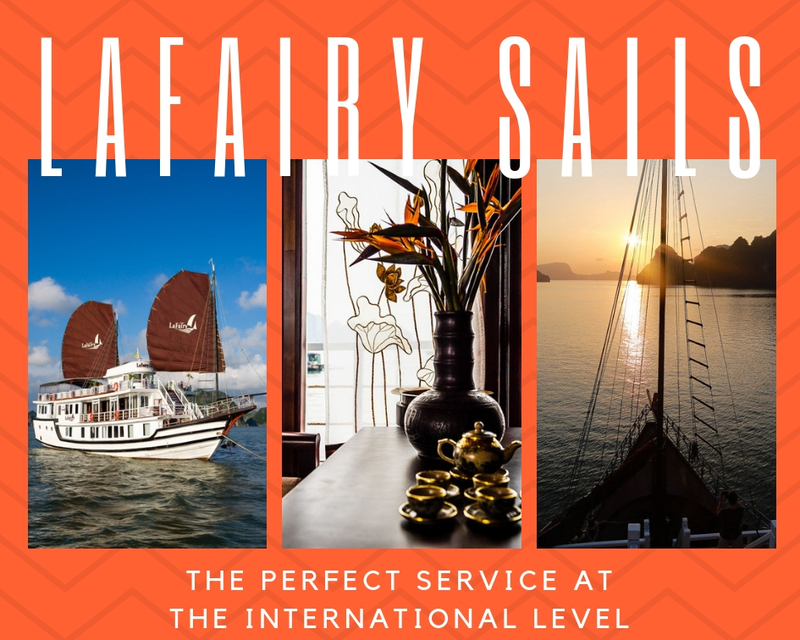 In the middle of the pictures, LaFairy Sails is one of the top Halong Bay cruises, shining like an oasis of luxury accommodation and professional services. This boat is a quiet enough space for those who want to relax, exciting enough to anyone who'd like to enjoy different experiences in this magnificent land. With the perfect service at the international level, troubles in your life will not have a place in this wonderful escape journey! 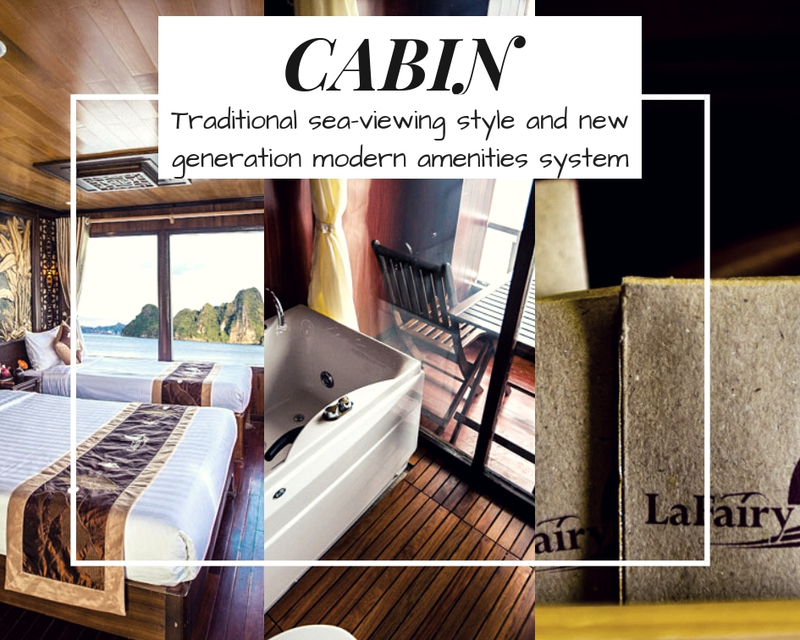 Not only having unique traditional sea-viewing style, the Lafairy Sails cabins also take point in new generation modern amenities system. All of them such as: individually controlled air-conditioning, hot and cold shower or tub, toiletries and bathroom facilities… will ensure for your comfortable stays. Surrounded room is the delicate patterns highlight in Vietnam ancient lifestyle as white silk curtains along with elegant decor details. Such as: lacquer flower vase, bronze lanterns, and more other special details. The safety suite is set up at easy reaching place in room. Life jackets, fire extinguisher, emergency lighting and hammer…always were checked regularly to warrant the highest safety conditions in anytime. 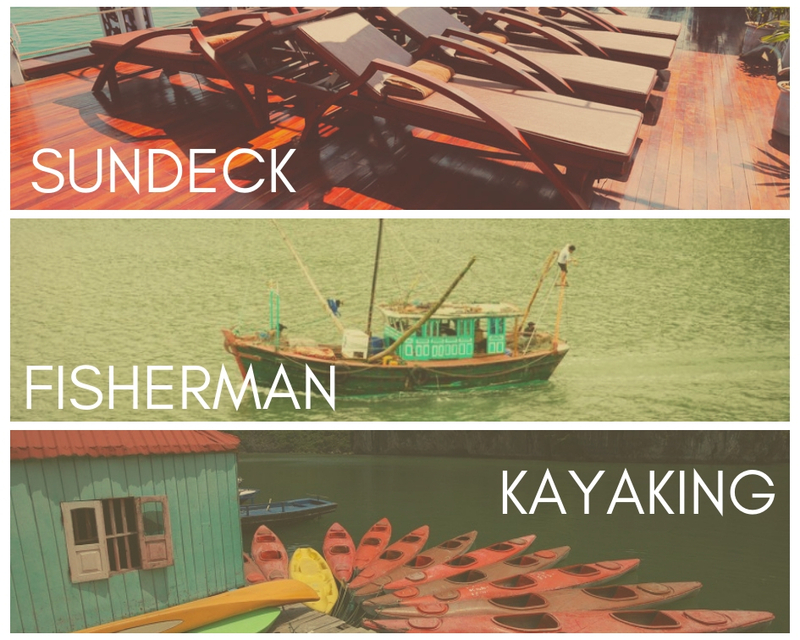 All the community spaces as: restaurants, sundeck, bar lounge…are noticed in details that expressing the truly images of Vietnam. With golden lotus curtain, with ancient’s house frame, with the uniforms of service teams. That you will have the clearly feeling about our beautiful country. You will be enjoyed the meals along the view of famous thousands of the stunning limestone (karst) of Halong Bay. You are also get more sight purest green vegetation on sea, or the parades of a lot unique décor ships are on the same road in Bay. The selective menu in International and traditional Vietnam. Specially, it is fresh catching seafood with cooking recipes recommended by tourists will blow your hungry away. Moreover than that, the entertaining in Bay also deserved with your money that you pay for this journey. The activities types are so variety and all of them also make deeply impressed while experiencing. You can find the most suitable choice to you whenever you'd like. You can join in the local cuisine cooking classes. Or get the adventurous kayaking trip to NgocTra area – the best beautiful cave area of Halong Bay with professional leaders. And if in permitted weather, you can spend your day on golden sand beach in Bai Tu Long to swimming and enjoying exciting sea sports. In the evening, a hot sumptuous meal will be served by our staff. After that, you can relax with a drink along with cooling winds from sea at the top deck while watching the sun set and the stars come out. At bedtime, air-conditioned cabin will have responsibility to keep stable cozy for cabin, protect your perfect sleeping. All of them graduated from the official course in the fields, and had many years to working with LaFairy Sail. Understanding clearly about the dreams of customer and the history of this land, they will be good ambassador to connect everyone to hidden beauty of Vietnam culture space. Not only that, they also is your perfect partner staying on your side 24/24 hours, always be ready with all request from you. "We did the three day two-night cruise and would highly recommend doing the two nights. That time is so wonderful that our tab at the end wasn't as much as we thought it’d be. I would recommend la-fairy to anyone looking for a friendly and relaxing cruise!" This is one kind of good words we receive that very make us more love the jobs. Thanks for customer who has given LaFairy the chance to prove that your choice is right. Origin Vietnam is the trusting agents in making Halong Bay luxury tour. Beside of LaFairy Sails, we have a plenty of other awesome choices to help you find the most wonderful tour. With great enthusiasm. Origin Vietnam is proud as the familiar friend for all tourist love Vietnam culture. Let browse in website: https://originvietnam.com or contact Hotline: 8482 909 8686. We were ready to companion with your upcoming journey.